Easie Peasie Co: Oh my Gravy!! I won!! Oh my Gravy!! I won!! Yesterday was just a busy loco day…wait I take that back…the ENTIRE WEEK was a busy loco week!! Thursday afternoon my best friend had her baby! Yay!! So I spent all Friday morning working on this…. And thank goodness for blogs…and learning new things! I learned how to make these tissue balls…which were perfect for this occasion! 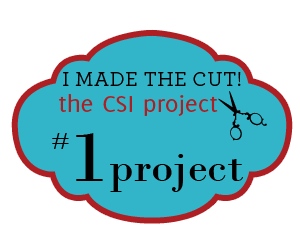 When I finally remembered to check for the challenge winners, I almost fell out of my chair when I discovered that I won the CSI challenge! Holy Canoli’s that is just the coolest thing ever! After I posted my kitchen pics and back splash pics I kinda felt sick at my stomach. I was worried it wasn’t cute enough! You know all of those “insecure” thoughts when you publicly show the world an artwork or creation!!! OMG! Gulp!! I’m so honored and proud to win! That’s just so awesome! Congrats to all the top 10 winners too!! ! Hope everyone has a SUPERB WEEKEND! P.S. Check out my delish, pretty little pickles that my Mom made! Don’t you just love them!! They are perfect, sweet and crunchy! Is it just me or is there something so comforting and nostalgic about fresh canned goods! Just stopping by from Lady Bloggers to say hello! Cute pictures! Adorable blog!